Triggerfish, often referred to as Triggers, are members of the Balistidae family, encompassing approximately 12 genera and 40 species. Triggerfish are a commonly kept aquarium species due to their inquisitive personality, large size and interesting patterns and colors. The Picasso Triggerfish (Rhinecanthus aculeatus) is one of the most commonly sold triggerfish species for marine aquaria. Other commonly sold species include the Niger Trigger (Odonus niger), Blue Jaw Trigger (Xanthichthys auromarginatus) and Clown Trigger (Balistoides conspicillum). Triggerfish are found in all the tropical and subtropical oceans of the world. However, the highest species diversity occurs in the tropical region of the Indo Pacific region. They can range in size from 6” (15cm) to nearly 3’ (1m) in length. Triggerfish live in a variety of habitats, with some being pelagic and others being more site attached. They all share a very characteristic swimming style that gives them the appearance of gliding through the water when swimming. One fascinating aspect of triggerfish is the defensive behavior that gave them their namesake. When sleeping, or frightened, triggerfish can lock their fins in place and secure themselves firmly in a crevice or cave. Triggerfish can make great aquarium inhabitant due to their puppy dog like personalities, however they are known to have a mean streak, so choose tankmates carefully. Triggerfish prefer a temperature range of 72F (22C) to 80F (26C). 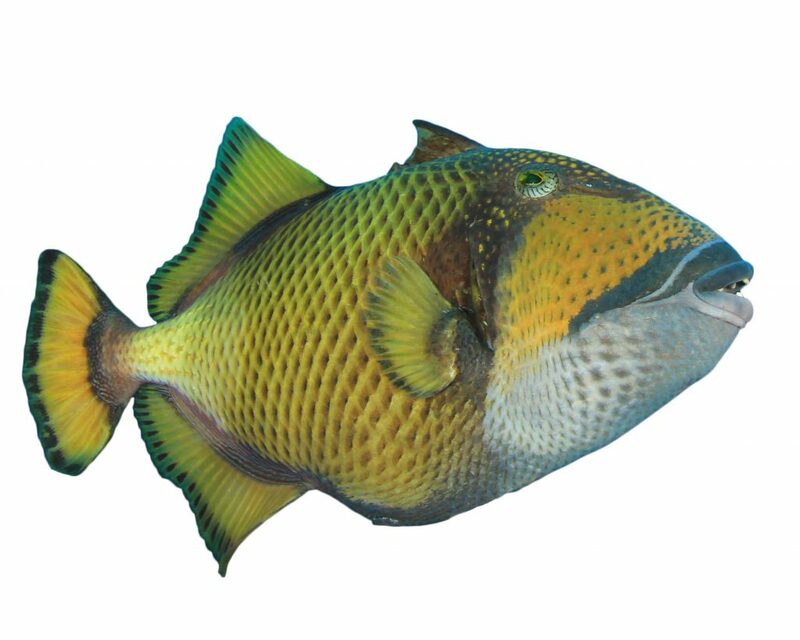 Some species of triggerfish such as the Clown Trigger (Balistoides conspicillum) are not considered reef safe, where as other species such as the Crosshatch Trigger (Xanthichthys mento) will typically be ok in a reef tank. It is important to consider carefully what species of triggerfish may be best for your aquarium. While smaller species such as the Blue Jaw Trigger (Xanthichthys auromarginatus) are suited to tanks as small as 75 gallons, larger species such as the Undulate Trigger (Balistapus undulates) may be better suited to a larger tank.